Ms. Williams, who is originally from Market Street, currently lives with her niece Alberta Brotherson and was cared for by her great niece Sharalyn Williams. 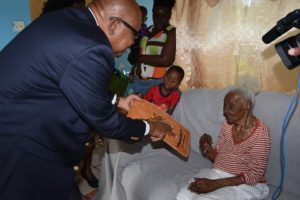 Minister of State responsible for Social Services and Community Development, Honourable Wendy Phipps, received a warm welcome from the centenarian as she commended her for the milestone celebration at a recent birthday of the centenarian. Governor General, His Excellency Sir Tapley Seaton, visited Ms Williams recently and gave her tokens of appreciation for her service to the country as part of World Centenarians Day in 2017.